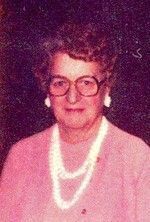 Mrs. Gladys K. Jessup, 98 years of age , a resident of Charlottesville, Indiana and former longtime resident of Knightstown, In. passed away Saturday evening, March 14, 2008 at Country Home Manor. I have fond memories of Gladys Jessup when she worked with my mother, Marjorie Wilkinson, at the Knightstown Public Library. She was always very nice to me and my friends when we would hang out at the library after school. She used to spoil us at Christmas with her peanut butter fudge and assorted cookies. Gladys was a sweet and gracious lady. My condolences to her family. Gladys was a lovely lady when I worked with her at Knightstown Public Library after her retirement from Lilly. She was a very responsible person and took good care of her sister, Stella, her home, and neighbors and friends in the community. We would like to extend our condolences to her caregivers and others who knew her.